AncestryDNA is known as the most user-friendly service in the genealogy DNA testing business. It’s perfect for people who want to research and grow their family tree, but who don’t want to get into the nitty-gritty of verifying DNA segments. AncestryDNA also maintains one of the largest autosomal DNA collections in the world. AncestryDNA’s test lab uses the most advanced techniques and equipment in order to measure up to 700,000 points in the human genome, offering an astounding 90% accuracy rate. Their huge database has one of the most comprehensive collections of genetic signatures available in the whole world. And size matters: the more this collection grows, the better and more accurate the results get. Ancestry’s customers tend to be more focused on creating family trees and discovering their ethnicity than technical DNA projects. They are all over the map – from part time family members to semi-professionals. In contrast, Family Tree DNA offers more professional features & services such as project support, an open database and the accuracy of results – rather user-friendly design. For example, customers of 23andMe can easily upload their data to the Family Tree DNA platform to obtain more accurate results for ethnicity predictions. AncestryDNA offers good customer support, and it’s designed for real genealogists. Their support center makes it easy to find quick answers to any question you might have about starting a new family tree, uploading a GEDCOM file, connecting with recent members, finding the right webinar, publishing your own memories and even hiring an expert. To solicit answers from more people, you can ask the community or post your question on one of Ancestry’s forums. Everything is designed for the novice, too, so you can find relatives with ease and discover your true roots. All DNA samples are stored either at one of Ancestry’s storage facilities or at the testing laboratory. You can automatically upgrade your test for deceased relatives and even nominate a beneficiary for your DNA account. While Ancestry and 23 and Me stores DNA samples indefinitely, Family Tree DNA stores the samples for a minimum of 25 years. To learn more about Ancestry’s storage policy, read their Privacy Statement at http://dna.ancestry.com/legal/privacyStatement. Since it was introduced back in 2012, Ancestry’s DNA test database has grown to become one of the largest autosomal DNA data sets in the market. The Ancestry DNA database has grown from zero to over 1 million people in less than 3 years. Ancestry’s data base has enabled over 99 million connections of fourth-grade cousins. In other words, an average of 2 out of 10,000 people are related to people within 5 generations. You have access to these connections in their database – that’s why size matters so much. Here is an infographic that explains how connected we actually are: http://blogs.ancestry.com/ancestry/files/2015/07/DNA-US-Infographic-505×1024.jpg. Ancestry’s database contains samples from over 1 million people. Countries in Europe and North America are the most well-represented, while countries from Central Africa are under-represented in the database. As more samples are available to the researchers from Ancestry DNA, the tests will become increasingly accurate and will have a lower chance of error. In contrast, Family Tree DNA has a total of 150,000 people in their database, and 23AndMe has a database of over 1 million people. The method for collecting DNA samples used by the scientists from Ancestry DNA is a saliva sample. Family Tree DNA uses a cheek swab. 23andMe uses a saliva sample, too. Saliva sampling is a convenient and non-invasive method of obtaining DNA material for the test. Conversely, cheek swab samples do not give as high a yield. For more information about the benefits of saliva samples over cheek swabs, check out this DNAGenoTek.com article. The testing process used in the Ancestry DNA test uses the Illumina OmniExpress SNP chip. AncestryDNA uses 682,549 SNPs (Single-nucleotide polymorphisms), compared to only 577,382 used in the test provided by 23andMe. Ancestry DNA uses 885 Y chromosomes and 17,604 X chromosomes in its testing process. Conversely, Family Tree DNA’s testing method uses no Y chromosomes. The test from 23andMe uses the most: 2,329 Y chromosomes and 19,487 X chromosomes. Additionally, 23AndMe uses 3,154 mitochondrial DNA SNPS for more accurate results. The data from Ancestry DNA includes medically-related SNPs and matches 5 cMs (centiMorgans) for the first segment. All of the information extracted from your test can be downloaded from the website. That said, it is not all available to you within the service. Ancestry’s ethnicity results are fine, but they are middle-of-the road in terms of coverage and accuracy. 23andMe provides the most sophisticated ethnicity analytics, offering three unique Ancestry Composition reports – standard, speculative and conservative. These results can tell you where your ancestors lived before the migration in the 16th century. If your family comes from the British Isles, please note that Ancestry’s genome set isn’t as robust as other tests. While both Ancestry and Family Tree DNA have access to small genome samples from the British Isles, 23andMe has a huge sample set of over 1100 genomes, which enables them to have more accurate results. If you’re looking for the best genetic ethnicity test, consider using National Geographic’s Genographic 2.0 ($199). This unique test takes into account all the discoveries made under the National Geographic project over the last 6 years. The National Geographic Genographic 2.0 test uses more than 20,000 Y chromosomes to provide the most accurate results. Ancestry’s autosomal test examines your unique genetic code against its database of 1 million others, to find clues about your family history. After your saliva sample is extracted, the test lab studies 700,000 unique “markers” (SNPs) in your DNA. To find people you are related to, the test looks for segments of DNA that are similar to other people. For instance, a grandfather has a strong relationship status with his grandson due to the large amount of DNA they have in common. To reveal your ethnic origins, the scientists from Ancestry DNA compare your distinct genetic profile to haplogroups (genetic clans) representing 26 regions around the world. The estimations are also based on the origins of your parents and grandparents. Ancestry.com has built a huge database of genetic profiles from 26 regions of the world, known as the “reference panel”. This reference panel is used to create a unique genetic profile. To determine the roots of each of their clients, Ancestry DNA compares their results with the results in each of the 26 areas. The reference panel contains approximate figures and estimates for each of the regions you might come from. For example, your results might show an approximate amount of 99% on Europe. Out of that, there may be 40% chances that you come from Wales, 30% from UK, 14% from Scandinavia, 10% from Central Europe, 5% from Spain, or 1% from North Africa. 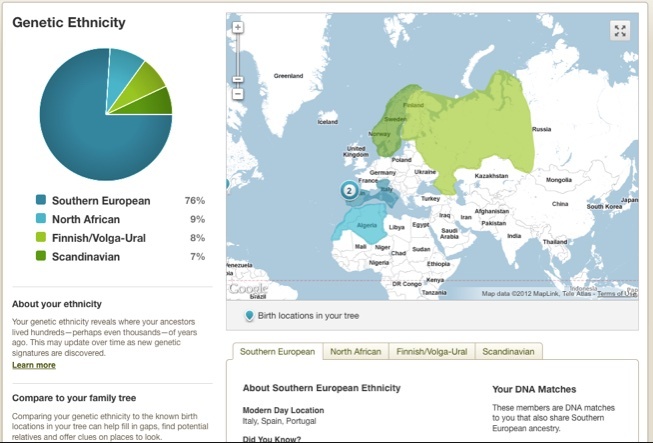 Ancestry’s biogeographical analysis is the most accurate of any test today. Rated on a 1-10 scale, with 10 being excellent and 1 being poor, the overall accuracy and sophistication of the biogeographical Ancestry analysis from Ancestry DNA rates a 9 in ISOGGG’s review. Ancestry DNA test compares your DNA results with all the DNA samples they have in their database in order to find your relatives. The only thing AncestryDNA can’t tell is exactly how closely related you are to a certain individual – because they offer no chromosome browser. But you’re not out of luck. This where Ancestry.com’s family tree data, DNA Circles and Ancestry Discoveries features come into play. The single largest drawback to using AncestryDNA vs. FamilyTreeDNA or 23AndMe is Ancestry’s lack of a chromosome browser. A chromosome browser lets you peer into the genetic segment details of each DNA match, so you can draw your own conclusion. While chromosome browsers are technically the only way to be sure of a match, they are also complicated & tough for most people to master. Instead of a chromosome browser, AncestryDNA provides a graphical user interface called “DNA Circles” to help you uncover new matches. The following video walkthrough gives you a feel for how DNA Circles work. Once a DNA match is found, if both you and your match have a family tree built on Ancestry.com, the system will try to determine exactly how you two are related. When it finds a match, you will both receive a hint leaf. Then, you can use the “Review Match” button to see the data behind your match. The more people that build trees, the more accurate DNA Circles becomes and the more useful your DNA becomes in the process of finding your relatives. Once you find a distant relative, you can contact him/her right on the platform by pressing the Send Message button. The other cool DNA-matching feature (just released in 2015) is “Ancestry Discoveries”. In this feature, AncestryDNA surfaces potential ancestors back to the mid-1700s using DNA matching. Ancestry Discoveries is completely automatic and vastly simplifies the hunt for long-lost ancestors. We strongly recommend verifying any new matches found using hard, cold research – but it’s an incredibly efficient way to surface new possible matches. Very cool. 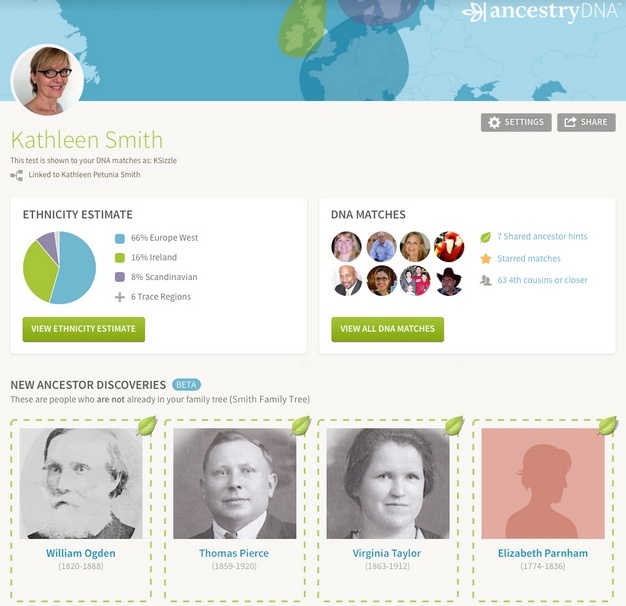 The main sites http://dna.ancestry.com/ and http://www.ancestry.com/ are both intuitive and extremely easy to use. You can either login or start your 14-day free experience by pressing the link on the first page. Once you enter the main platform, you will have access to a wide range of features including Family Trees, Search, DNA, Collaborate and a Learning Center. In the DNA section, you can view summaries of your DNA test data. In Collaborate, you can connect with others to confirm matches, work as a project team and more. AncestryDNA can be purchased as a standalone test ($99). We also strongly suggest getting a subscription ($49) to Ancestry.com, or you may find the limitations of the standalone test frustrating. The shaky leaf! Can’t say enough about this feature – what a timesaver! 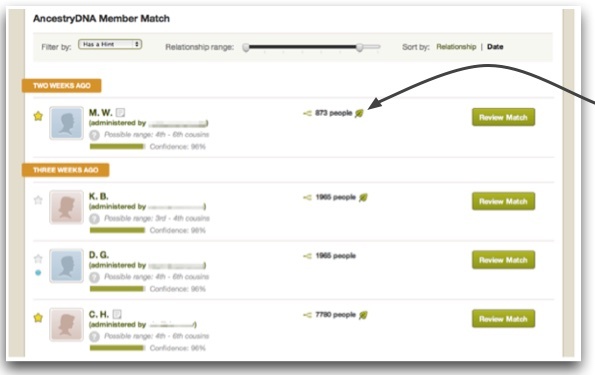 Ancestry uses the shaky leaf to alert you to new information about your family tree. A shaky leaf might mean there’s new documentation available online or that someone just claimed one of your relatives in their tree. Or, if you’re using AncestryDNA, it could mean that a new potential DNA match was found to their database. The shaky leaf will save you a ton of time. It’s like putting your genealogy research on autopilot. Simple, intuitive user interface. 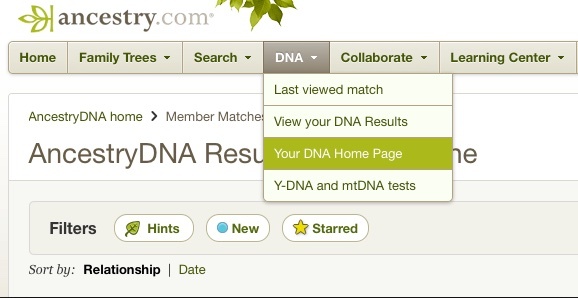 Ancestry has done a great job simplifying the DNA matching process and integrating it into their best-in-class genealogy research platform – although they did overlook a few critical features (see below). The website is easy to navigate, too. Simplified DNA matching: while AncestryDNA hides the details, it nevertheless looks at a broad range of DNA in order to help identify matches. This information is summarized and applied in their Circles tool (see video below), which simplifies the matching process considerably. A complete genealogy platform: DNA alone is not enough to build your family tree on, and Ancestry.com understands that. By tightly integrating their DNA database with Ancestry.com’s online trees and records data bases, consumer and semi-pro genealogists have everything they need to quickly stitch-together an extended family tree. Largest collection of family trees in the world. And you can connect with any of them (if they aren’t locked). Of course, you can’t get at them without a monthly subscription to Ancestry.com. DNA Circles is a pretty cool way of displaying your long-term ancestry / haplogroups. Ancestry.com’s users are genealogists. Which means you can expect a reply when you contact a new match. Abundant match information. They’ll link you to matching surnames on your match’s trees, even if you share no common ancestor. DNA matches are unconfirm-able. Unfortunately, the variety of matching conditions, lack of a chromosome browser and use of DNA Circles can lead many users to think that all matches are confirmed. In fact, none of them are. You’ll need a separate chromosome browser or similar tool to do that. Some family trees are private/locked. If a match’s tree is locked, you can’t connect with them. Poor quality ethnicity test – even for your majority ancestry. Probably due to their lack of Y-chromosome and mtDNA data. Ancestry.com subscription is required to unlock some features. 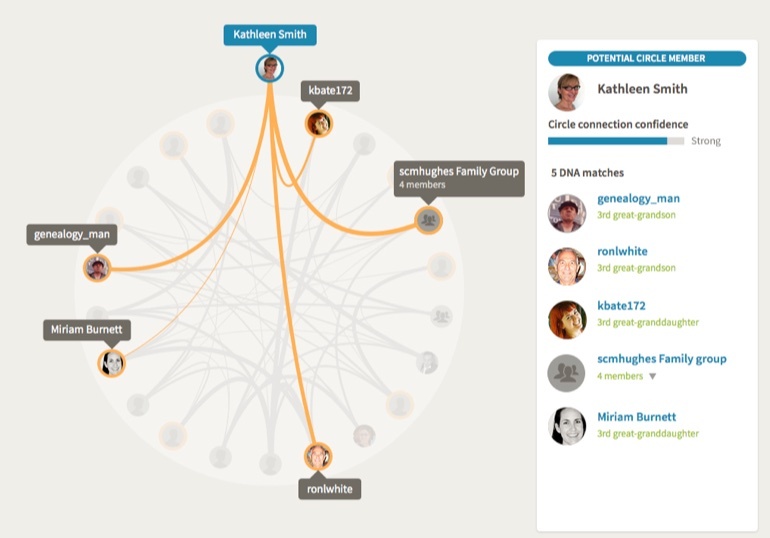 For example, if you want to view all of the details on DNA matches and DNA circles. Pricing starts at $49. This is not at all clear, when you sign up. Communication with new matches is via an internal messaging system. A saliva test kit is used, which is generally considered less effective than the cheek swab kit used by FamilyTreeDNA and the Genographic Project for young children and older people. Customer service is not great. We find them responsive, just not well-trained on genealogy and DNA matching. No Y-chromosome or mtDNA data (at all). Ancestry.com destroyed these data bases in 2013. DNA data is from mostly U.S. customers. AncestryDNA recently entered the UK and Ireland markets. No chromosome browser or any other way to confirm or dive into the details of a DNA match. To confirm a match, you’ll need to transfer your results into Family Tree DNA or into Gedmatch. This is a big oversight that increases your total solution cost. Founded in 1983, Ancestry.com operates the oldest and largest for-profit genealogy research service in the world. They have always been a company built for, and dedicated to, genealogy research. In 1983, the company was focused on publishing genealogical books. Ancestry’s long–term strategy remains the same, however, which is to help every person on our planet to discover, preserve, cherish and share their unique family history and genealogy. Ancestry.com is a global company, with offices in London, Sydney, San Francisco, Silver Springs, Stockholm, Dublin and Munich. Since January 2003, Ancestry.com has been owned by the well-famed European equity brand Permira. Permira.com is a leader in technological investments, with an investment of over $10 billion in technology, $5 billion in the industrial sector, $11 billion in the consumer sector, $2.5 in the financial sector and $1 billion in the healthcare sector. Ancestry.com has working relationships with the best scientists in the world. Their Scientific Advisory Board is comprised of the following scientists: Catherine Ball, Ken Chahine, Jake Byrnes and Scott Woodward. In addition, third-party consultants who work with Ancestry include: Jeffrey Botkin, Philip Awadalla, Mark Daly, Carlos Bustamante, Brenna Henn and John Novembre. Ancestry didn’t get started in genetic matching until relatively late in the game. Launched in 2012, AncestryDNA is a autosomal DNA test and genetic genealogy research platform designed to function as an add-on for the Ancestry.com community. But they’ve caught up, since. With many features, best-in-class simplicity and integration with historical records, the AncestryDNA makes it easy to build your family tree and find 4th cousins from all around the world, using your DNA. You can get started in a few steps and immediately uncover your geo-ethnic makeup. Then, with just a little more effort and a few lucky matches (leaves), you can leverage your personal DNA data against Ancestry’s data base of 1 million others to build out your family tree horizontally (new cousins) and back in time to the 1700s. What is your source for 110,000 people from people in GB and 140,000 from Ireland in the AncestryDNA database? How can Ancestry have people in their matching database from over 100 countries. They only sell test in 6 countries.